Formation. After the team name is a set of numbers in parentheses. This indicates the formation used by each team; in this case the same: 4-3-1-2. That’s four defenders in the back, three midfielders (a central midfielder [often a regista] and two wingers), one attacking midfielder or withdrawn forward (a playmaker often known as a ‘no. 10’, or a trequartista or fantasista in Italy), and two strikers. The goalkeeper is not included because they are a ‘given’ (the Dutch think this is a mistake; they include the keeper when they talk about formations). Here’s a guide to soccer roles (in Italian). Player names and ratings. Here are the players’ last names followed by a number from 1-10 which is the rating that the journalist assigned them based on their level of play. Most ratings fall between 5-7; anything below that is dreadful; anything above that is very good. No one ever gets a 10. Player ratings are notoriously subjective, but that doesn’t stop anyone, even to trying to quantify a comparison between the present best players in the game (Messi and Ronaldo). After some player ratings you see a parentheses, which indicates when a player was substituted out (21’st = 21st minute of the secondo tempo, ‘second half’). If the player coming in had enough time to play (usually more than 10 minutes), they also get a player rating. Otherwise there’s just the designation ‘sv‘ = ‘senza voto’, i.e., ‘without a rating’. ‘A disp.‘ lists the players on the bench who never entered the field of play. Even the coach (allenatore) gets a rating! Referee. The referee (‘arbitro’) also gets a rating. Referees are mythic figures in calcio; they can have epic stature (in particular Pierluigi Collina, regarded as one of the greatest referees ever for his quiet command of a game) or exemplify tragic folly (such as the referees caught in match-fixing scandals). Last Saturday I took Simon and Jakob to see a new film called “L’Arbitro” at Cinema Méliès. L’Arbitro, directed by Paolo Zucca, tells two parallel stories that intersect at the end: the tale of an ambitious referee doing all he can to ref ‘The Final’, and the journey of a bottom-level village team in Sardinia which has a chance at long last to win a title. It is a tragi-comic pantomime which even has some subtitles in Italian so people here can understand the Sardinian dialect. There are many brilliantly funny moments and unforgettable characters, and underlying the film are several cross-currents of honor and ethics. The boys loved it. Apparently it will appear at the Italian Film Festival in Seattle, and hopefully get wider release in the U.S.
Five-min excerpt: http://www.youtube.com/watch?v=ZCexDBpqXfw; interviews and clips: http://www.youtube.com/watch?v=qiJg5LwBZEk. Scorers. Who scored, and when (22′ pt = 22′ in the primo tempo [first half]). 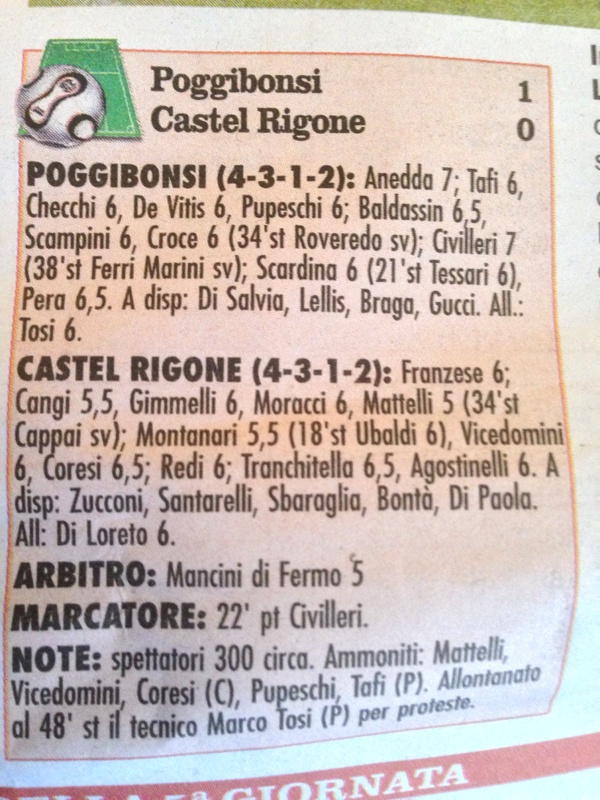 Note: Attendance figures; the players on each team that received yellow cards (ammoniti, ‘warnings’); and a note that the coach of the Poggibonsi team was expelled from the game at 48′ of the second half (in other words, right at the end), for ‘protesting’ (that is, yelling at the refs). As I mentioned in the first post, the players and staff of Castel Rigone have both the philosophy and reputation of respect for the referees (which is quite unusual), and so I’ll be watching, curious if emotions ever get the best of their players, coaches, and fans. Speaking of referees, I watched the Ajax v. AC Milan Champions-League match on Tuesday at Elfo’s, the neighborhood pub with a marvelous selection of craft beers, especially affumicata (‘smoked’) beers. Ajax dominated the first half, but couldn’t score; Milan ruled the second, until the 90th minute, when late Ajax pressure led to a wonderful headed goal off a corner. With just added time remaining, Milan pushed for an equalizer. Ajax cleared a ball off the line, and looked to have withstood the storm, when Mario Balotelli won a penalty for Milan by grabbing an Ajax defender from behind and then falling over with him as if he himself had been pulled down. It was an atrocious dive, and a terrible decision by the referee, but it ended up tying the match 1-1. Watch the play for yourself (video location: 6:30): did the ends justify the means (that’s a question for AC Milan fans…)? Sometimes, sport is theater, and here Balotelli played the pantomime villain. UPDATE: On Wednesday night, Castel Rigone narrowly dropped a Serie-C Coppa Italia match 1-0 to local rival AC Perugia (the big local club). It was a battle until the Brazilian Fabinho struck for the Grifi (Perugia) at 23′ of the second half.